Analysis: Qatar-Gulf split means splitting headache for the U.S.
President Donald Trump’s visit to Saudi Arabia last month had all the triumphal trappings of an 18th century English King visiting his French counterpart. There was a red carpet as Air Force One arrived in Riyadh. The 81-year-old monarch, King Salman Abdulaziz Al Saud, greeted him at the bottom of the stairs, as trumpets blared and fighter jets streaked overhead. Mr. Trump was celebrated with a royal medal, a larger-than-life image of his face on his hotel and a high-spirited sword dance. But the President’s ostensible strategic triumph – embracing, solidifying and elevating a U.S.-friendly coalition of Sunni Arab countries against Iran and the Islamic State — was suddenly undercut today. There have long been tensions between Saudi Arabia, considered the top Gulf power, and oil-rich Qatar, which repeatedly tries to thwart Saudi aims. But why the rift now? Four of its leading members, Saudi Arabia, Bahrain, the United Arab Emirates and Egypt, broke off ties with another one of their group, Qatar. Diplomats were recalled or ordered to leave their posts, Qatari citizens were expelled from all four countries, flights were cancelled and sea and land borders closed. This is bad news for the U.S., which wanted to cement a solid Sunni front against its two regional adversaries: Tehran and extremist groups in the neighborhood. And it puts Washington in a bind. Saudi Arabia is the closest U.S. ally in the region, but Qatar hosts (and pays for) a major U.S. military base vital to the air campaign against ISIS. He was referring to the al-Udeid Air Base, the forward headquarters for U.S. Central Command, used extensively by U.S. warplanes in the region. With Qatar an isthmus connected to mainland only through its now-closed border with Saudi Arabia, the U.S. has no land access to it either. 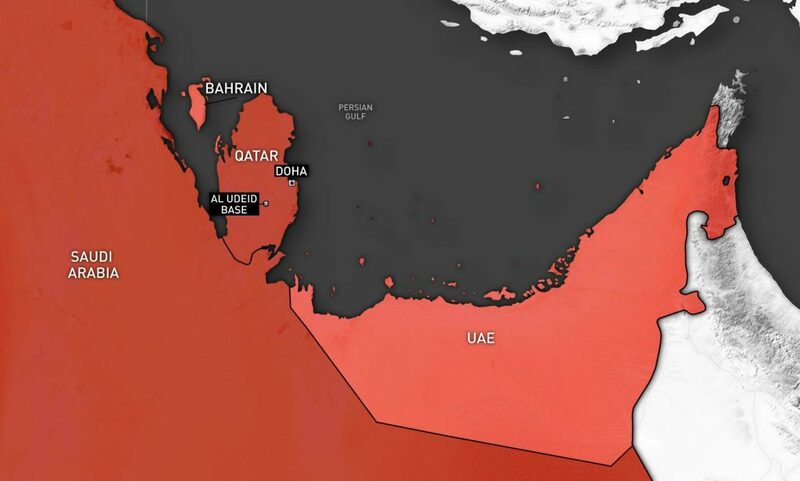 This map shows Qatar and some of the surrounding countries who have broken away from it. Vali Nasr, dean of the Johns Hopkins School of Advanced International Studies, believes the Trump visit may have played a part. He thinks the 31-year-old Saudi deputy crown prince and defense minister, Mohammad Bin Salman, was emboldened to make this power play by President Trump’s decision to choose Saudi Arabia for his first foreign trip as president, and so warmly embrace the Gulf monarchies. In a statement, Riyadh said it was acting to “protect its national security from the dangers of terrorism and extremism,” referring to the history of wealthy fundamentalist Qataris funding extremist rebel groups in Syria. That’s a clear case of the pot calling the kettle black. Wealthy Saudis did much the same, as both countries propped up proxy fighters to bring down Syrian president (and Shiite) Bashar al Assad. There is some substance to Riyadh’s other charge, that Qatar is more accommodating to Saudi‘s Shiite nemesis Iran. Qatar has called for dialogue with between Iran and the Gulf, and Qatari emir Shayk Tamim bin Hamid al Thani called Iranian president Hassan Rouhani to congratulate his May 20 re-election. But Qatar has little choice, since Iran and Qatar share the world’s largest natural gas field. I asked the former senior U.S. official, if he were still in government, would he recommend the secretary of state go to the region to negotiate a settlement? 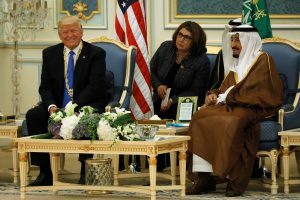 Left: Saudi Arabia's King Salman bin Abdulaziz Al Saud, right, welcomes U.S. President Donald Trump at the Royal Court in Riyadh, Saudi Arabia May 20, 2017. Photo by REUTERS/Jonathan Ernst.